• Before Ted Kennedy endorsed Obama in hopes of shattering the racial glass ceiling for the Oval Office, he helped to break religious barriers with the election of his Catholic brother, John. While still in Law School, Ted served as Western states coordinator for the campaign, grinding hard in the streets of both Wisconsin and Wyoming. After those two highly-contested states went blue, he was largely credited with J.F.K.&apos;s presidential victory. • Out of all members of the Kennedy clan, Ted was closest to his brother, Robert. So when assassins took the life of his anti-war sibling, Ted channeled his grief into inspiration. While the sadistic President Nixon was preparing to drop napalm on Vietnam citizens, Ted delivered one of his most well known speeches, urging Americans to carry on his brother&apos;s legacy and fight for human rights. Ted concluded with a quote from Robert: "Some men see things as they are and say why. I dream things that never were and say why not." • Ted Kennedy was at the forefront of the anti-Apartheid movement. In direct defiance to South Africa&apos;s racist government, Kennedy visited activists, Desmond Tutu and Winne Mandela, in Soweto to put the injustice on blast. Upon returning, Kennedy pushed for sanctions against South Africa, which eventually led to the Comprehensive Anti-Apartheid Act of 1986. President Reagan&apos;s attempt to veto the act was a FAIL - marking the first time in the 20th century that a president had a foreign policy veto overridden. • When President Reagan nominated the reactionary, Robert Bork, to the Supreme Court, Kennedy went innington. Bork held what&apos;s referred to as an "originalist" judicial philosophy - basically meaning, do whatever the Founding Fathers wrote. Fearing that Bork would attempt to dismantle civil rights once confirmed, Kennedy spit a scathing diss speech on the Senate Floor that well exceeded 32 bars. Bork&apos;s fan base was outraged but caught off guard and his nomination was soon ethered. In this clip, you can see current Supreme Court Justice, Sonia Sotomayor, in Kennedy&apos;s entourage during the battle. 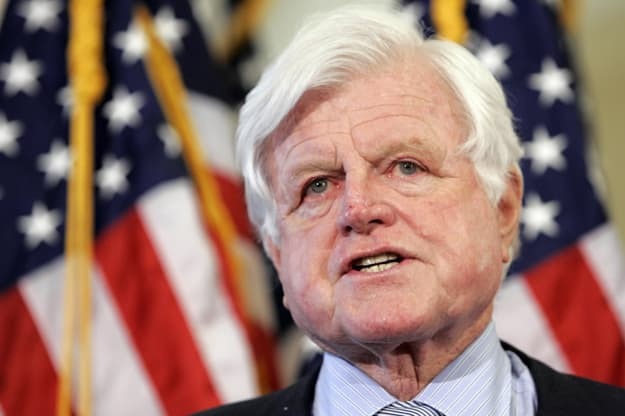 • While other heavyweight Democrats tip-toed around making an endorsement for the Democratic nomination, Ted Kennedy shook up the race by co-signing Obama for that #1 spot. In all fairness, Kennedy was one of only 23 Senators who voted against the 2001 invasion of Iraq and Hillary had voted for the war. The endorsement was a watershed moment in the campaign, intensifying Obama&apos;s momentum to help him secure the nomination and go on to make world history. Thanks, Ted. R.I.P.